Zoo Miami is offering a sweet summer deal of $5 admission this month for FIVE whole days, sponsored by Ford Motor Company ! Guests visiting the zoo on these days will be treated to a ton of giveaways and activities – including freebies from Ford when they enter to win a new 2015 Ford Fusion. 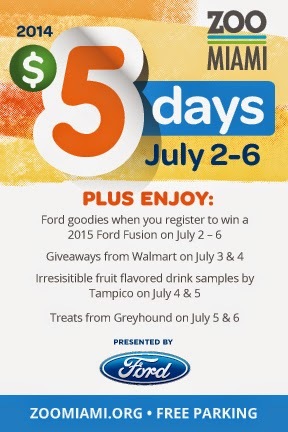 Sponsors Walmart, Greyhound and Tampico will also be keeping guests happy and refreshed with giveaways! Come join Zoo Miami for this HOT summer event!